I still can’t believe it’s already been two months since Fletcher was born! My experience with being a new mom has been such a rewarding one and I wanted to do a little recap on here about what it has been like so far. During the last few weeks of my pregnancy, I started to feel a little anxious about the whole labor experience (mainly due to the plan changing so many times with scheduling a c-section, then canceling that and scheduling an induction, then having him come on his own) but other than that, I felt fairly confident about everything else. I’ve been around babies throughout my life — babysitting, growing up in a neighborhood with tons of kids, volunteering in the church nursery, etc. and felt pretty good about taking care of one of my own. Plus, I had no doubts that my intuition would serve as a good backup in any areas that I wasn’t sure about. Delivery was really quick so I felt like it was over just as soon as it had started. I was a little sore during our time in the hospital from the stitches, but other than that, I felt SO good. Despite being really sleep deprived the first week, I felt so much more like myself than I had all throughout pregnancy so that mindset shift was a game changer for me. We stayed in the hospital for two nights and when we arrived home, I felt well enough to do things like make meals, shower, stay on top of laundry, etc. I think I mentioned this in a previous post, but this was key for me — I’m not one that likes limitations, so feeling like I could still do things like this in addition to taking care of Fletcher made me feel confident and at ease. I had some bleeding that ceased around 3.5 weeks and experienced night sweats for the first two weeks — I would wake up DRENCHED but I’ve heard that that is a sign that the water retention from pregnancy / IV’s / delivery leaving your body. Other than these two experiences, I didn’t really notice anything else symptom-wise. I have been loving this new role as a mom so, so much! Being Fletcher’s mom has brought me so much joy — this probably sounds funny if you’re not a parent but even bringing him with me to run errands makes me so happy! I love this sleepy, snuggly baby stage but also look forward to all that we can do as he continues to grow. Having Andy watch Fletcher while I take a hot bath, paint my nails, take a nap (a lot of these are from 8-10pm but it helps so much), hitting the gym, and continuing hobbies such as blogging and reading. 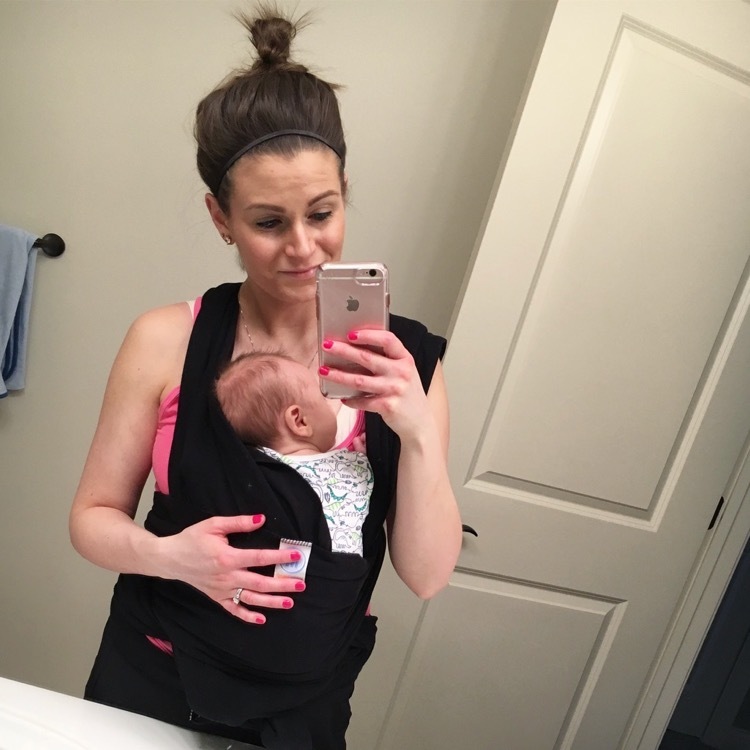 Eating healthy, working out, and prioritizing sleep have been major contributors to why I felt so good even in those first couple weeks post-delivery. I started walking the week after he was born and just twenty minutes on the treadmill in the evening helped my mind so much! I’ve also been intentional about what I’m choosing when it comes to fueling my body. Lots of fresh fruits, vegetables, fats, and proteins. I’m starting to transition back to my vegetarian ways now that I’m not pregnant anymore and I feel like this is helping as well — towards the end of pregnancy I felt like I was forcing myself to eat meat just to keep my protein levels up. Scheduling haircuts, pedicures, chiro appointments, etc. I will say that cabin fever is the thing that I’ve struggled with most during this maternity leave. It doesn’t help that it has been absolutely frigid outside and this has been one of our coldest and snowiest winters ever. Luckily, I still have a month of maternity leave left and the extended forecast is looking pretty promising with sunshine and highs in the upper 40s and low 50s next week. On days when it’s been gray and damp, even just bundling up and hitting the Starbucks drive-through or returning / picking up books at the library has helped so much since it means we get out of the house. On this same note, spending time with friends has helped tremendously! Something that isn’t really talked about much is how maternity leave can feel lonely — especially if you’re an extrovert like me! My Mom’s Life group, lunch / dinner with friends, etc. has really helped me feel like myself! Andy and I have been working together as a team to make decisions for Fletcher and our family. We’ve both never done this before and some of the decisions that we have had to make right off the bat have been hard because we would go back and forth weighing our options on different things. We’ve learned that our intuition is pretty strong and have been trusting that when we’re faced with something new — so far, it is working really well. It’s also been fun to be able to decide how we want to raise Fletcher — abiding by routines, establishing traditions, and setting boundaries. We both grew up with different family dynamics, so it’s brought up a lot of good conversations about what we want to prioritize and avoid as parents. For the first two weeks, we were kind of just in survival mode — we were setting alarms every 2-3 hours throughout the night to feed him since he was so tiny at birth and then dropped some weight in the first few days. Once we switched to only getting up once per night, our days got a little easier. Andy was home for the first week and that really helped — we would trade off so the other person could nap or shower and that really made a difference. Once Andy went back to work, I started our own little routine for Fletcher and I. We typically follow a sleep, change diaper, eat, play, cycle all day and he seems to really thrive on this schedule. It has also helped to move around the house a bit — the first month or so we camped out in the master bedroom most days since that was just easier with feeding, sleeping, etc. However, the past few weeks we’ve been spending time in other rooms such as reading books in Fletcher’s nursery, taking naps in his swing in the living room, working in the office instead of on my laptop on the couch / bed, and doing tummy time in the loft. Moving from room to room definitely helps to switch things up a bit not just for me, but also for him! He seems to enjoy the change of scenery. Also, baby-wearing is something I never thought I’d really get into, but it has been a lifesaver for getting things done around the house! Fletcher loves being cuddled close to me and usually takes a solid nap whenever I put him in the wrap. It’s so nice because it allows me to easily vacuum, make lunch, or even walk on the treadmill. My sister has been SO generous in sharing a ton of her baby gear with us and this wrap was one of the items! I was pleasantly surprised to see how my body has adjusted post-pregnancy. My belly shrunk down really quickly — probably within the first three weeks, and it was crazy to see myself drop 20 pounds in the first week alone (newsflash — that weight was Fletcher, the placenta, amniotic fluid, and SO much water retention). I still have a little ways to go to get back to my usual self, but I’m confident that I will get there since I’m eating my normal diet and staying active. I’ve also been surprised to find how much grace I’ve had for myself during this transition period. It also still blows my mind that my body grew and sustained him and now provides his nutrition for him effortlessly. I’ve been back to the gym for the past few weeks and before that I was running and walking on our treadmill at home. In terms of nutrition, I eat my regular diet which consists of lots of fresh fruits and veggies, fats such as avocado, nuts, peanut / almond butter, coconut oil, etc. and proteins such as eggs, protein powder, greek yogurt, etc. I was surprised to realize how hard it is for me to accept help from others, even during a time of need. One of our neighbors gave us a ton of preemie and newborn baby boy clothes and although I was really excited for these, I also felt a little weird about accepting them since they literally gave them to us. The same goes for people that have dropped off meals — we are so thankful for them, but I always feel so odd accepting help, I don’t know why! Another thing that has surprised me is just how seamlessly Fletcher has fit into our lives. Sure, there’s a lot more tasks to do each day and we’re on a feeding schedule, but he’s so cheery and laid back — making it easy to go about our usual schedules with the fun addition of a little boy joining us! If you’re a mom, what was the adjustment period like for you? What’s one of your favorite things about being a parent? 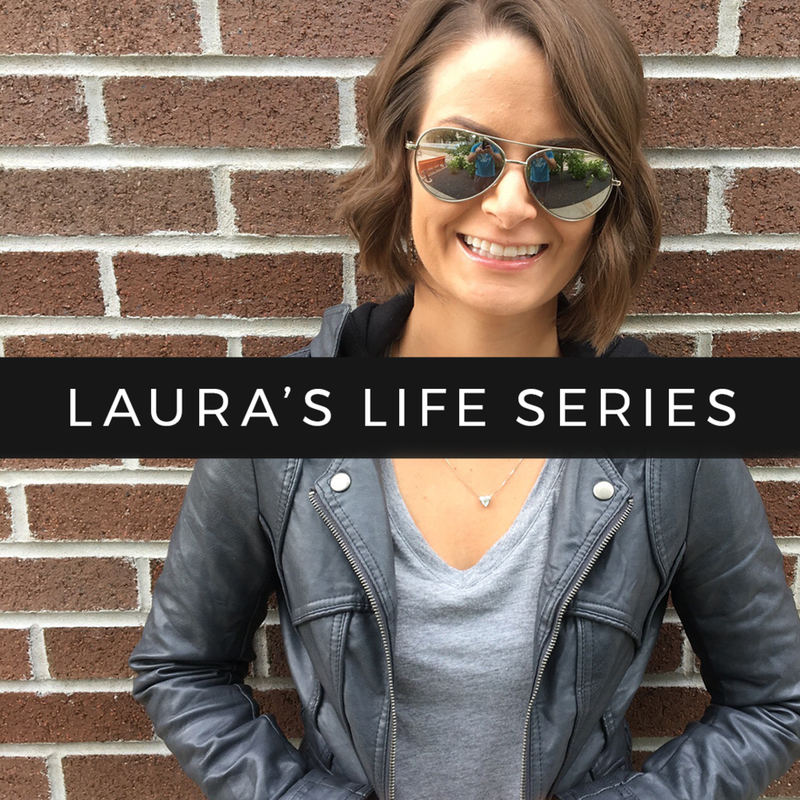 This is my very last recap of my pregnancy — I wanted to do one last post on this so I can look back on this special time in my life! Click here for his birth story! Fletcher was born at 40 weeks and 4 days, which was the same “age” I was when I was born since my due date was on St. Patrick’s day and my birthday is the 21st! 6 pounds 8 ounces and 18.5 inches at birth! He’s a sweet little boy! He definitely ran out of room towards the end and most of his movements only involved kicking his legs and waving his arms as opposed to tumbling around. It was crazy because I could totally tell what body part was where towards the end — his little heels kept kicking my ribs and sometimes his little feet would get kind of stuck under my ribs if I tried to lean forward / get out of a chair while his legs were in that position. I’m no longer waking up at 2:30am for a snack, but I am up multiple times each night to flip from one side to the other since my hips are killing me. Around 38 weeks, my hips started getting SO sore after laying on them while trying to sleep. I keep waking up around 3:30 / 4am, and usually toss and turn until 5 or 6ish then fall back asleep for a couple more hours. All I can say is, I am SO looking forward to sleeping on my stomach again! Lower back is really sore and the top of my belly hurts — almost like the muscles are just really tender in that area. I’ve also had such a hard time breathing and have had some bouts of dizziness / headaches (my doctor has been monitoring this and all is well!). Since I’m home now and really haven’t been going out a ton, I usually just wear shorts or my maternity joggers. My black skinnies are kind of falling apart, so jeans are usually what I wear whenever I leave the house. Green smoothies have been on heavy rotation for me! Spinach, dates, almond milk, frozen banana, greek yogurt, and peanut butter all whipped up in the blender. I wake up looking forward to this each morning, ha ha. Still on my prenatal, folic acid, prenatal fish oil, and vitamin D. I’ve also added in this magnesium supplement to help with calf cramping and a probiotic as well. Daily walks on my treadmill — I try to go for at least 35 minutes but usually end up doing closer to 50 minutes. A lot of people look forward to having a glass of wine after they have their baby; I, on the other hand, have a whole list of foods I’m looking forward to eating after he is born. Some of those items include: soft cheeses, deli sandwiches, and a smoothie from our local smoothie shop. Still need a few decorations but otherwise everything is basically done for now! I’m hoping to illustrate or handletter a print or two for him while I’m home on maternity leave. I shared these the other day! Knowing we are SO CLOSE to meeting our little dude! Our new life together as little trio! What did you most look forward to post-pregnancy? Out of the three trimesters, this one definitely flew by the fastest! Below are some of my favorite items that helped me through weeks 28 until the very end! 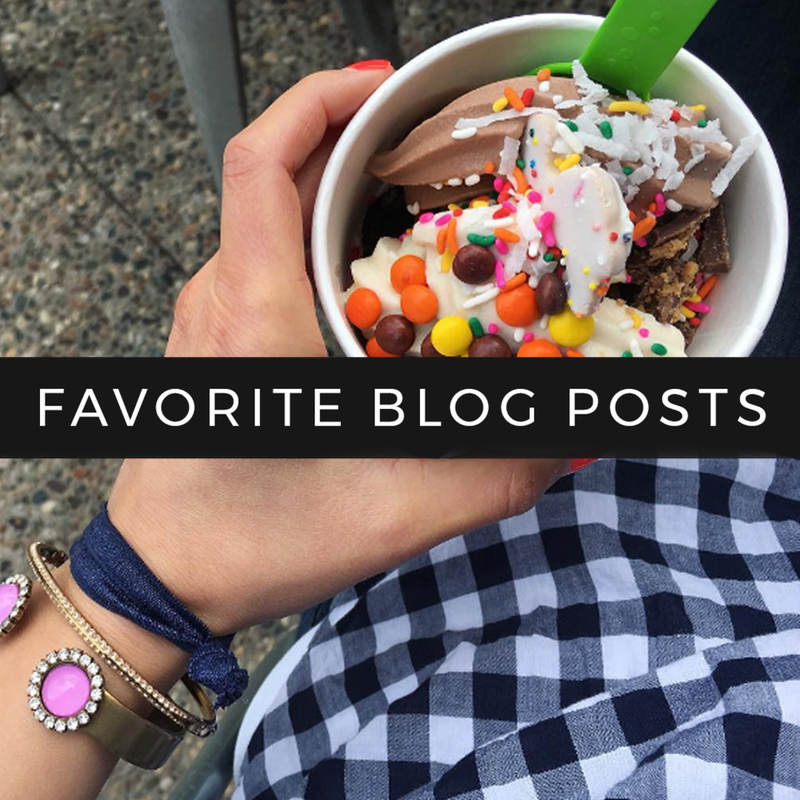 If you missed my first trimester favorites, you may check them out here along with my second trimester favorites here. I’m not sure whether to call these “cravings” or if it was a weird case of “nothing sounds good except for like four foods.” Either way, Trader Joe’s natural salted peanut butter was on heavy rotation through the past few months — I love this one because it’s not so thick like most peanut butters. I used to check this app constantly in the very early weeks of my pregnancy but then things got even more fun towards the end because baby started doing more, growing more, and the timeline got closer and closer. I used a few other pregnancy apps but this one was definitely my favorite, mainly because it would show how big your baby’s hands and feet were each week! This helped me to relax and sleep a little better during some rough weeks of insomnia. During my weird insomnia streaks of waking up in the middle of the night, I ate a bowl of cereal almost every time because it always helped me go back to sleep. Honey Bunches of Oats was my go-to for many weeks! Another food that I couldn’t get enough of — many days 2-3 of these were consumed. We buy them in bulk at Costco each week and they are SO perfectly in season right now. Oranges were another daily occurrence— so refreshing! Okay, whoever says that you have more energy after the first trimester was definitely not the case for me! I have never taken so many naps in my life — this sleep mask definitely helped me fall asleep faster when I tried to lay down while it was still light outside. We added this comfy recliner to the nursery right around Thanksgiving and I have been enjoying sitting in it SO much! I like to take my coffee up there on weekend mornings, read a book, and just relax. It’s definitely my favorite cozy little spot in our house! PS I’m linking up with Shay and Jenn today! What’s the coziest spot in your house? One of my friends that recently had a baby girl sent me this article last week that really helped so much during this small stretch of time that falls between pregnancy coming to an end and a new life waiting to emerge. To be honest, I’ve found myself realizing that it’s kind of a strange state to be in as you find yourself waiting, wondering, and worrying. I keep wondering what birth will be like, what will he look like, and if will we be waiting around or if he will come fast and furious in the middle of the night. It’s exciting but also a little nerve-wracking as well! I’m really trying to savor this special week, knowing that it is such a pivotal one that lies between the end of an era and the beginning of a new one. We went on a date last Friday night and whenever we do, we always wonder if this will be our “last date” before he arrives or if he’ll hang out in there for a few more days. On our way home from our evening out, we stopped to pick up one last baby item that we realized that we needed — some newborn pants for him to wear around the house with his little onesies. Andy found two packs of them and they are seriously the tiniest little pants ever! I washed them this weekend and started laughing out loud as I hung them up on the drying rack in our laundry room because they are so cute and little! All of his little clothes are washed, hospital bags are packed and by the door, and the car seat bases are installed in both vehicles. We are ready for him to arrive whenever he decides to make his entrance into the world. It makes me so happy to see his little baby carrier in the backseat of my vehicle while I’m out running errands. Speaking of which, I ran to Costco last week and couldn’t help but smile when I realized pretty soon we’ll be having a little sidekick joining us on our everyday adventures — even if it’s something as simple as grabbing groceries. My due date is tomorrow and on one hand, I keep finding myself longing to make plans, get out of the house, and really take advantage of these last few days before having a baby. On the other hand, I’ve also been trying to rest as much as possible, knowing that we won’t be getting much sleep these next few weeks / months, but it’s hard when you have this crazy urge to organize ALLTHETHINGS (literally every closet and cabinet is spotless right now). I’ve even gone as far as going and getting a car wash and cleaning out my vehicle just because I feel like I need to be doing something productive! It was almost 50 degrees and sunny one of the days last week and it seriously felt like spring outside! Usually we are either drowning in blizzards or powering through negative temps as highs this time of year so this weather has been so refreshing! I was joking to Andy that it feels a bit like Groundhog’s Day over here to be on maternity leave without the baby. Each day I wake up, whiz through a list of tasks that I set for myself, workout, shower, take an epsom salt bath, go to bed, repeat. For someone who is so go-go-go, it feels really strange to not being going to work each day and doing things that matter more than organizing your basket of manicure supplies that sits on the shelf of your linen closet. It’s weird because all of these random organizing tasks honestly do something for your mind during this stage — it’s way more satisfying than usual — it’s hard to explain! I keep trying to remind myself that taking care of myself is taking care of my baby right now, so I’ve been focusing on really solid nutrition, staying active by working out every day, and getting as much sleep as I can even if that means taking two naps each day. Any guesses on what we are naming him? If you’re a mom, how close to your due date did you have your baby / babies?